Tuesdays and Wednesdays at 10 a.m. in our downstairs event room. 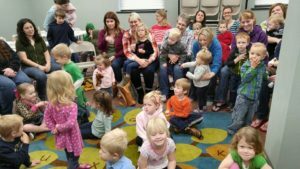 A typical storytime includes Miss Val reading 2 – 3 books, 1 – 2 group songs or fingerplays, craft or activity, snack, and play table. Themes are based on the favorite themes of young patrons as well as seasonal and holiday themes throughout the year. Suggestions for future themes are welcome – take the poll here. Storytime will end for the summer on May 29 and resume in mid-August, replaced by summer reading June – early August. Summer Reading: Please see our summer reading page for full details. We usually meet Tuesdays and Wednesdays at 10 a.m. at the library. The program runs from June – early August. Did you know that Miss Val makes a list each month of new children’s books and audiobooks added to our collection? View them here.